Vice President, Real Estate Development, Opus Development Company, L.L.C. Matt Rauenhorst serves as vice president of real estate development for Opus Development Company, L.L.C., focusing on creating new retail development opportunities in the upper Midwest with a concentration on markets in Iowa, Minnesota, Wisconsin, North Dakota and South Dakota. 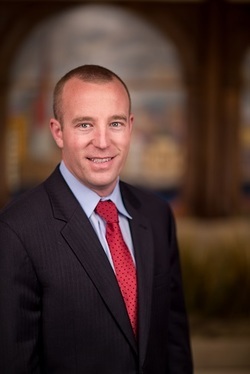 Rauenhorst joined Opus after having worked as an associate in the acquisitions group of Dividend Capital Total Realty Trust located in Denver. While there, he was part of a team that acquired more than $240 million in commercial real estate. Prior to that, Rauenhorst was with Frauenshuh Commercial Real Estate in Minneapolis and was responsible for the acquisition and disposition of many of the firm's holdings. Rauenhorst’s first formal experience in real estate development was with Opus as a member of the leasing team for Flagship Office Center, Crescent Ridge Corporate Center, and Arbor Lakes Medical Office Building. After completing his undergraduate degree, Rauenhorst worked with Habitat for Humanity building affordable housing in South Minneapolis for one year. Rauenhorst serves as a director on the board of The Caring Tree. He holds a bachelor’s degree in entrepreneurship from the University of St. Thomas and a master’s degree in business administration in real estate and urban land economics from the University of Wisconsin.